In the wake of the Charleston shootings there was a renewed call to remove Confederate monuments throughout America. Few cities have seen this process play out in such stark terms as in New Orleans. 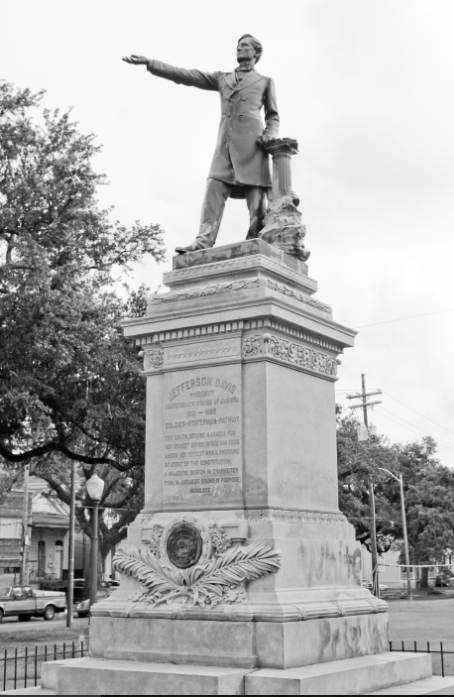 The city has many Confederate statues, the most prominent being Jefferson Davis, Pierre Beauregard, and Robert E. Lee. All three are set for removal. A monument celebrating the 1874 victory of the White League has already been dismantled. There are plans to place them elsewhere where they will be explained in context, but nothing hard and fast has been laid out and the city has a bad reputation in this regard. A beautiful statue of Joan of Arc lingered in storage for decades after being given by France. Moon Landrieu, father of the current mayor Mitch Landrieu, lost the Washington Artillery Hall remnants. They were removed to build a park in the French Quarter that does honor the unit’s long service. Those remnants though were basically removed for a tourism project. Slowly but surely New Orleans’ already tenuous connection to the Civil War is disappearing. It is strange since this city was dramatically changed by the war. In 1860, New Orleans was the fourth busiest port in the world, with about as many banks and millionaires as New York City. After the war the city suffered a gradual economic decline that continues to this day. The decline had already set in before the war due to railroads. Much of the city’s interstate trade came from goods shipped from the upper Mississippi River and Ohio River by way of steamboats and flatboats. Abraham Lincoln himself manned a flatboat bound for New Orleans when he was a young man. River traffic though was on the decline even before 1861. The war then wrecked the economy even since much of the city’s wealth was tied to slavery. Sadly, there are very few markers to indicate the location of slave markets in New Orleans. A few of the museums do not sweep slavery under the rug, and recently a marker was put up pointing out where Solomon Northup was held by Theophilus Freeman before being sold to William Ford. Some of the plantations up river discuss slavery, in particular the Whitney and Laura Plantations. Outside of that, it is as if the city never had slaves. The Civil War was never part of New Orleans’ tourism economy like it is in Virginia, Charleston, and Vicksburg. There was no great land battle fought there, and the capture of the city, however important to the curse of the war, was an embarrassing defeat. One reason the statues will come down is the same reason Andrew Jackson’s famous statue is not going anywhere despite a few high-profile protests. Tourists like the Jackson statue and take lots of pictures, even if many of them do not know who he was or what he did. I stand by the Jackson Statue up to five times a week because it is where my French Quarter tour begins. 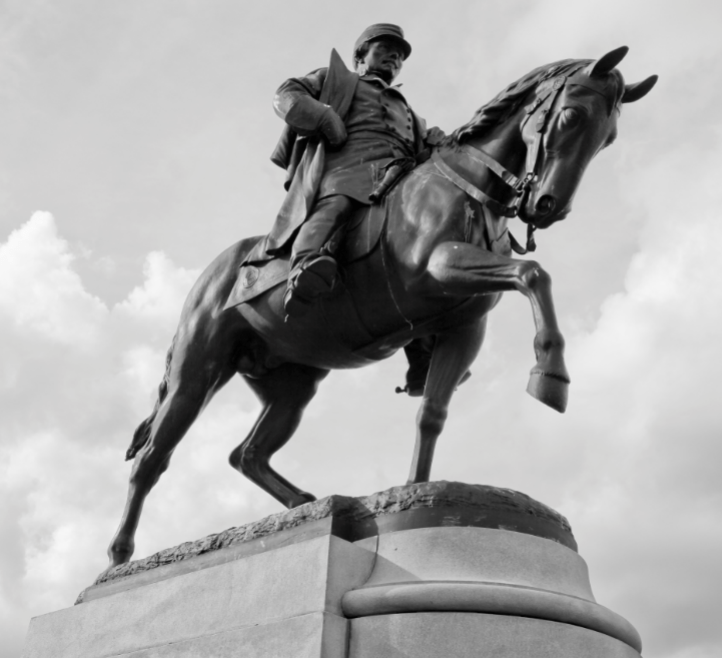 The most common question I hear,”Is that Stonewall Jackson?” I can understand given they had similar names and the Jackson Statue has “THE UNION MUST AND SHALL BE PRESERVED” engraved on the bottom, courtesy of Benjamin Butler. So tourists remember Stonewall and the union as having something to do with a war fought over 150 years ago. I did snap at a couple who thought it was a statue of Napoleon. We live in Manichean times. Both sides of the statue issue share a bitter loathing for the other, and so attempts at compromise are lost in the debate. 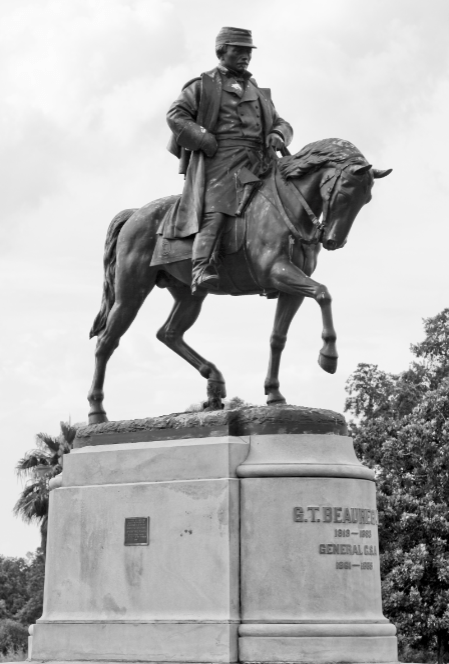 The removal of the Liberty Place and Davis monuments were more popular than the removal of Beauregard, a local man who did a lot of good for the city before and after the war. Yet, behind all the debates over slavery and statues there is what really drives everything: tourism. Mitch Landrieu is simply following in his father’s footsteps in emphasizing tourism. Both men took down Confederate markers for tourism projects. 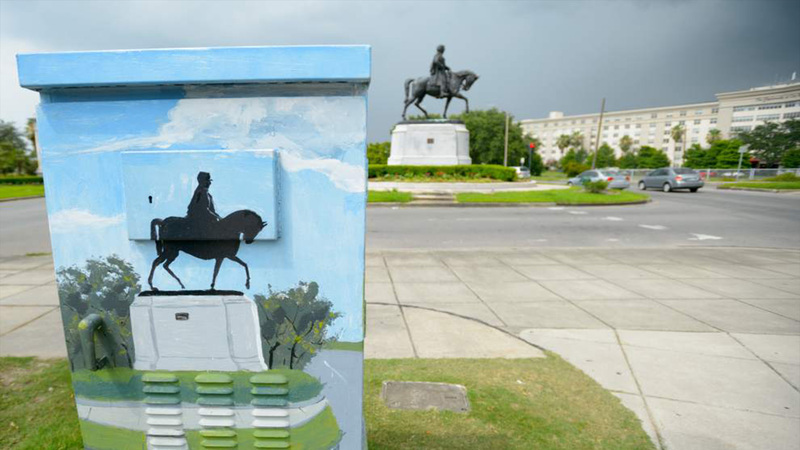 One reason these are being taken down is because Landrieu wants to have no tension during the city’s 300th anniversary celebrations that are slated for 2018. It seems likely there will be no statues to even local notables of the war. Some possible replacements could include Oscar J. Dunn, Andre Cailloux, or Algernon Sidney Badger. Dunn was the first black lieutenant governor in America. He helped create one of the most equitable state constitutions of its time. Cailloux was an officer who died leading a charge at Port Hudson, the first battle where black regiments fought in the war. Badger was a white army officer noted for his courage and devotion to civil rights. He was wounded while fighting the White League. Replacements have been discussed only in passing. Meanwhile, unless forced to, the Omni Royal Hotel does not want to advertise that their building was the country’s largest slave market before the war. We take down the statues but we also refuse to discuss slavery. We make history more palatable. After all, the reason people come to New Orleans is music, food, and architecture. 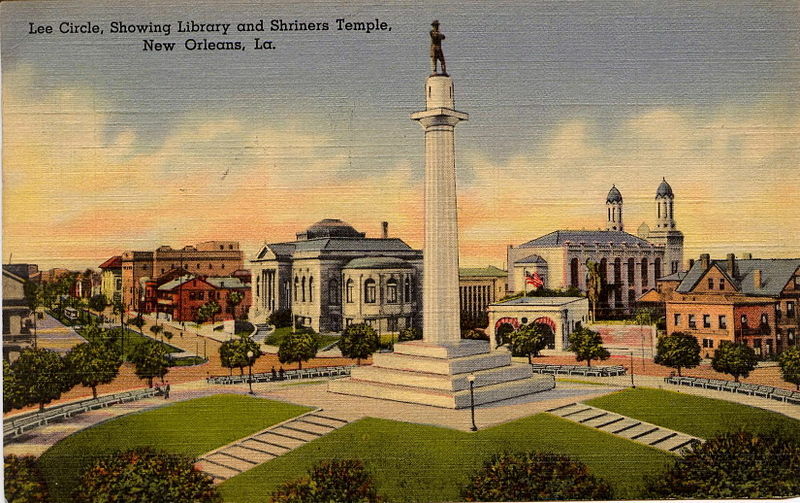 New Orleans is not Gettysburg, nor is it the National Holocaust Museum. The end result is that New Orleans, which has already forgotten slavery, is set to erase the Confederacy from its history. Attempts to rename streets, parks, and remove other statues, such as Albert Pike, have lost momentum but could happen in the coming days. However, the evidence that this city ever fought in the Civil War is disappearing. A moment for education and a new understanding feels lost in a bulldozer. Yet, make no mistake. That bulldozer is less about tolerance and good will than it is about tourism. 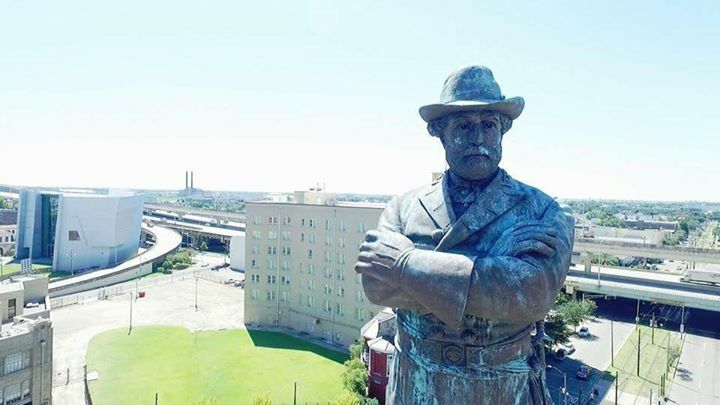 Now you can enjoy a New Orleans free of Confederate statues while the old neighborhoods that fostered Jazz and the city’s culinary tradition become one giant airbnb. It has already happened in the French Quarter, which now has 1,500 residents, the fewest since the 1720s. The nearby Faurbourg Marigny, home of Jazz greats Sidney Bechet and “Jelly Roll” Morton, is hardly a neighborhood anymore. Rents are on the rise in New Orleans, gentrification is solidifying, and tourism determines if we live or die. The removal of Robert E. Lee’s statue is for many a kind of justice, for some an insult to their ancestors, but it is also a symptom of the slow transformation of New Orleans into a kind of Disneyland for adults. Indeed, if the current city government cared about history and race then they would not have torn down the Woolworth’s on Canal Street. It was the site of New Orleans’ first lunch counter sit-in back in 1960. It is being replaced with a multi-story condominium high-rise. Lastly, the ongoing removal shows the depth of bitterness between the sides. Online and on the streets insults are hurtled with ease. Supporters of the statues sometimes spin webs of conspiracy theories and speak of history and tradition but without specifics. I wonder how much they know about Bull Run and slavery. Their reaction is unsurprising. Who wants to think their ancestor was evil for fighting for the Confederacy? Those who want them down are gleeful right now, asking why people want to honor treasonous losers fighting for a racist cause. I admit I support removal, except for Beauregard, but I am appalled at the self-righteous gloating and schadenfreude on display. For even wanting to keep one statue up, I sometimes get dirty looks. One thing is certain. The reconciliationist interpretation of the war, whatever its strengths and weaknesses, is fast dying out. This entry was posted in Memory and tagged Jefferson Davis, Pierre Gustave Toutant Beauregard, Robert E. Lee. Bookmark the permalink. Excellent piece. There seems to be a growing movement for removing what IMO is far too many monuments to the past. We are losing our identity in the process. There are ways to display these monuments in context that should satisfy both sides of the debate but the powers that be are not concerned with addressing that. It’s far too easy for them to just to take them down. Sad to say but every attempt at compromise was shouted down by both sides, and then drowned out in all the yelling. We live in Manichean times. I happen to agree, hiding unpleasant aspects of a countries history is exactly the wrong way to go about it. But the current political tenor on both sides in the United States flavors quick and simple solutions to complicated issues and compromise be damned. Excellent article. Here in Chicago, the tomahawking of a wagon -load of children is celebrated as the “Fort Dearborn Festival,” formerly known as a massacre. What about the fine Confederate museum near Lee Circle? Is that going anywhere? It is a private museum so it will not. No vandalism has occurred either. The place was almost shut down before 2005, but saved itself by changing the name (used to be Confederate Museum) and painting over a mural of Lee’s last meeting with Jackson. The interior is a real beauty. Once the cleansing of N.O. is complete,the cry will be, ironically, “On to Richmond”. Museum circle could be an appropriate name. Why don’t we fly a large American flag from the top of the column where Lee now stands?